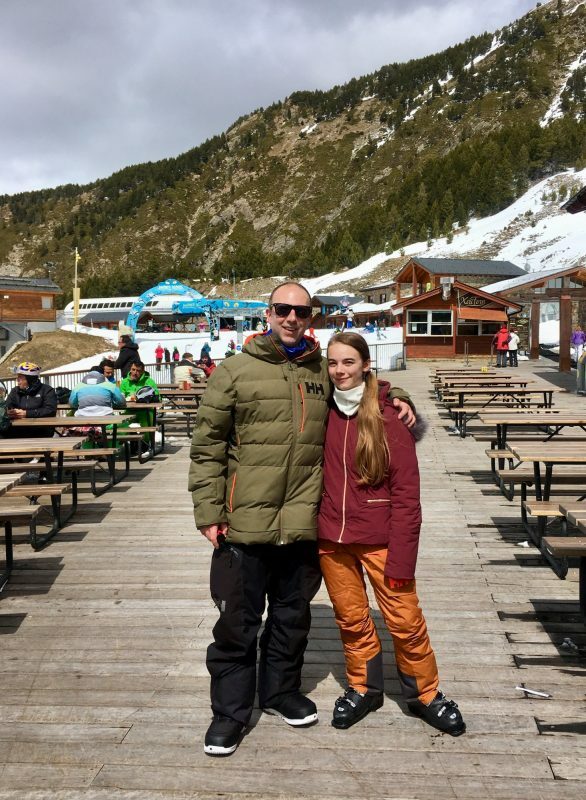 Having only ventured to French ski resorts before, I was brimming with excitement when I found out that my dad and I were going to Andorra for our Easter holiday. Even though Andorra was previously unchartered territory for me, my dad is somewhat of a regular, and he assured me that Andorra would be pleasantly surprising and different to what I had experienced before. A very small country nestled on the border between France and Spain, Andorra has no airport, with the closest being Toulouse in France or Barcelona in Spain. We flew to Toulouse, and booked the whole holiday (flights included) through Crystal Ski. The hotel we booked also gives free access to the airport lounge at Gatwick, which got the trip off to a flying start with a comfy seating area and a full cooked breakfast! Upon arrival at Toulouse we quickly found the Crystal check-in desks, with the reps on hand very friendly and professional. Before long we were already relaxing on our designated coach surrounded by people travelling to the same resort. We stayed at the 4* Hotel Piolets Park and Spa in Soldeu. The hotel itself was very modern with a good range of facilities. The rooms were spacious and clean, and the lounge and bar area on the ground floor was the perfect place to stop for après-ski, or chill out in the evenings with a game of cards. There was also outside seating, with tunes being pumped out by the resident DJ. Ski hire can be booked through Crystal Ski or directly upon arrival at the hotel. The hire shop is situated in the basement of the hotel, which was very convenient. One slight hiccup we had was that we hadn’t booked my ski hire previously, but the reps were very helpful and I was quickly kitted out ready for the next day. The hotel is an attainable 10 minute walk from the gondola station but if, like us, you dread the thought of walking that distance with all your gear (especially ski boots! ), the hotel does run an efficient shuttle service to and from the hotel parking lot every day which we found very useful. After a short ride up on the main gondola, there is an impressive range of slopes at your disposal. Ranging from blue to black, there are runs for everyone of all abilities. The slopes themselves are generally quite wide, with some even of a similar width to the M25! 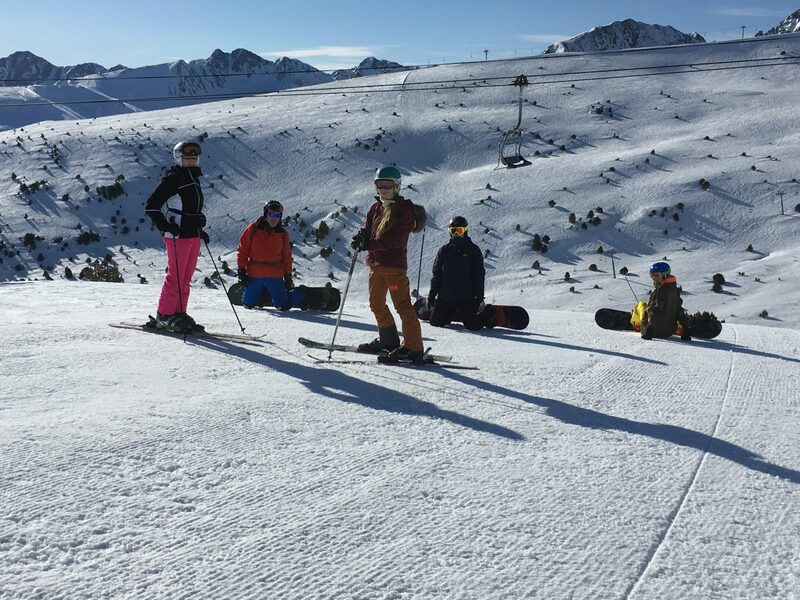 Not only are there all the beautiful pistes above Soldeu to explore, the area is also part of the extensive Grandvalira range, which covers all the way from El Forn to Pas de la Casa! Soldeu is situated in the middle of the Grandvalira and is considered to be the gateway with easy access to the surrounding areas. The whole area is very well-connected, with a wide variety of lifts taking you up the mountain. The majority of the ski lifts are modern, fast, efficient and family friendly. The only one I had trouble with was the Llac del Cubil, heading up into the valley of Grau Roig from Soldeu, as it lifts up way too quickly at the top and I was left to jump as it caught me by surprise. Just in front of the main gondola up from Soldeu is the ski school complex, with an information building and a wide open space which covers all of the meeting points of the various groups. Finding your group is not a problem, as you are told exactly where to go by the knowledgeable staff stationed at multiple windows along the front of the building. After previously having bad experiences at ski school where, if anything, I regressed, I was apprehensive about joining a school. However, the Grandvalira has a reputation of excellence in ski schools, and my experience certainly lived up to that. I was sorted into a group of teens, where everyone quickly became friends – this made the days so much more fun! I also can’t fault my instructor, Emili, who was very enthusiastic and instructive. Not only did we get taught the basics, we were also going off piste, doing jumps and 180s and riding switch! None of these extras were compulsory though, so there was no pressure in doing anything we felt uncomfortable with. As well as everything included in the holiday packages, Crystal Ski offer chargable extras to make your trip that little bit more special, such as dog sledding and skidooing if you can find the time for it. Personally, as an intermediate skier, I was keen to take a trip to the dark side (as my dad calls it!) and booked onto a snowboard taster lesson. Typically, these lessons last two hours and take place on Saturday mornings, but as there was only one other person taking the class it got shortened to an hour. I found the class very helpful as there were only two of us, so the instructor could focus on us solely and make the experience feel more personal, with progression at the right pace for both of us. Although one hour may not have been enough, the snowboard hire is for the whole day so I could keep practicing after the end of the lesson. Despite the gale force winds that day, I enjoyed snowboarding a lot and would definitely rate the taster highly. As we were out in spring conditions, we weren’t sure what to expect on the weather front. However, the range was basked in sunshine throughout the week, and we were even treated to a dusting of snow mid-week. I highly recommend beating the crowds up the mountain by taking the first gondola up, as you can’t beat the sensation of making fresh tracks in untouched powder. Since you can burn thousands of calories during a single day of skiing, it is a good excuse to treat yourself to a decent lunch up in the mountains. Here the Grandvalira has got your back, with many tasty options spanning the area. You could go and relax in the tea lounge located next to the Soldeu ski school complex, or else take in the panoramic views from the Coll Blanc KSB restaurant on the pass between Grau Roig and Pas de la Casa. One personal favourite was the restaurant located at the bottom of the Soldeu gondola, with excellent food (especially the pizzas) and views of all the bottom runs. After long, hard days on the slopes, you can kick off your ski boots and head straight to the spa in the hotel. Inside, there is a kids’ splash pool, jacuzzi, large swimming pool, steam rooms, saunas and showers. There is also a heated outdoor pool with water jets, which we found was a great place to sit back and watch the sun set over the snow-capped mountains. Included in the booking of the hotel comes two free spa passes. It can get quite busy, especially between 4-7pm as this is the only time kids are allowed in. However, we went after dinner both times, and there were only ever a couple of other people in there at this time. Another thing to note is that you must wear a swim cap during your time in the spa, but these can be purchased from the desk for a couple of euros, with towels also provided free of charge. If the spa life isn’t for you, there are also many bars if you walk into town, such as the Aspen Bar where you can go and chill out. Even though a lot of them had shut for the season, there was still a decent choice of places to go. If all else fails, the hotel bar is still one of the best places around. In addition, there is a convenience store where you can purchase snacks or drinks a short walk away. Back in the hotel, meals are served at breakfast and dinner in the form of a buffet. A wide choice of food was always available with anything ranging from octopus salad to spaghetti bolognese! All the food was always cooked to a high standard and was delicious, with fresh fruit always available during every meal. Overall, I was very impressed with the whole trip, and I can say with certainty that it was my favourite ski holiday to date. Andorra may only be a small country, but it certainly does have character and I can’t wait to return another time in the not-so-distant future! 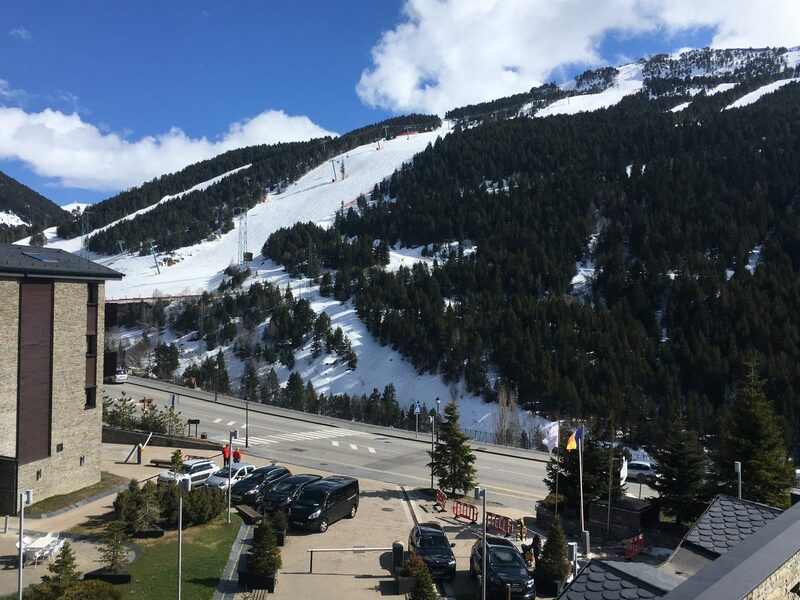 Click here to learn more about why Andorra is such a popular destination, particularly for off piste skiing!